Book sales will no doubt sky rocket with Benedict’s resignation next week. But this superficial reason won’t hold those really interested in one of THE most pivotal thinkers of the Church in the 20th and 21st centuries when Volume 2, Joseph Ratzinger in Communio: Anthropology and Culture (Michigan/Cambridge, Wm. B. Eerdmans Publishing Co., 2013) is in the mailbox. Joseph Ratzinger in Communio: Anthropology and Culture is edited by David L. Schindler and Nicholas J. Healy. 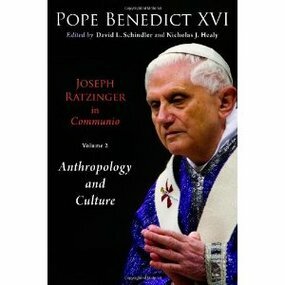 The 14 texts herein address anthropological themes written by Joseph Ratzinger between 1972 and 2005. That Eerdmans is the publisher is a terrific help since their list is widely acclaimed and ecumenical. In 2010, David L. Schindler et al. published what is now known as volume 1 under the title of Joseph Ratzinger in Communio: The Unity of the Church. If you don’t know about the Communio journal, it is an international quarterly journal of theology and culture, founded in 1972 Hans Urs von Balthasar, Henri de Lubac, Jean-Luc Marion and Joseph Ratzinger, among others. There are 21 Communio study circles that meet to discuss the published articles or some other agreed upon text. As an historical note, Communio was a journal promoted by Father Luigi Giussani for the ongoing theological education of members following the ecclesial movement, Communion and Liberation.